The Compact SCP is a slim profile plate mounted axial fan. The fan design, construction and finish provides a strong durable and weather proofed range. Compact fans boast highly efficient lightweight, robust motors, with proven reliability, ensuring long life and trouble free operation, excellent all round performance and simple speed control. 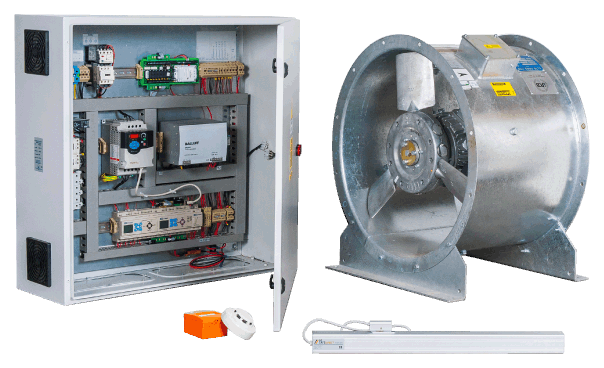 The Compact SCD is a short cased axial fan designed for duct mounting. The fan design, construction and finish provides a strong, durable and weather proofed range. The Compact fan boasts highly efficient lightweight, robust motors, with proven reliability, ensuring long life and trouble free operation, excellent all round performance and simple speed control. The Jetflow SJ range of all metal in-line centrifugal fans are designed to provide the ideal solution for high performance requirements in medium pressure systems. Ideally suited to a wide range of residential, commercial and industrial extract or supply applications, Jetflow boasts one of the most extensive range of fans on the market to meet system requirements. The Hideaway SH is a range of duct mounted in-line centrifugal fans designed specifically for installations where space is at a premium and noise levels are an important design criteria. The Quietflow SQS is a range of acoustically treated single in-line fans for internal mounting, manufactured in galvanised steel with a natural finish. These compact units are designed to overcome space restrictions in buildings with low ceiling voids, whilst also providing exceptional sound characteristics when fans are close to building occupants. Approved Document B (ADB) states that unprotected parts of a building’s escape route should be limited to ensure that those inside do not have to travel excessive distances when exposed to the immediate danger of fire and smoke. Here, we look at the options that Be Safe Direct can provide to ensure compliance with ADB. Regardless of the size or complexity of the project, advanced digital techniques and computer modelling can be used to plan fire safety and smoke control systems, as well as optimise the layout of the building. Here Dan Foster explains Computational Fluid Dynamics and the role it plays. New research suggests that tenants are not receiving sufficient fire safety information and advice from landlords. Download a FREE copy of our new smoke venting brochure now. Sign up to our newsletter for exclusive offers, promotions & product updates. "My total experience with besafedirect was first class. The advisor I spoke to couldn't do enough to help me. I would highly recommend this company. They keep to their word." "Brilliant piece of kit. Easy to install and perfect for holding keys and fire documents. All delivered within 48 hours." "Bought as a replacement for an existing unit. Very easy to fix as it only required the main cable to be trimmed and connected. The service from Be Safe Direct was excellent. Delivery was prompt and packaging excellent. Made even better by an extremely keen price."